"The master of more plots than a whore has lovers has been neatly caught in someone else's." "When we are guided by His will, killing is a sacrament." Powerful, dangerously compelling, action packed and beautifully written, Grave Mercy by Robin LaFevers is a mind-blowing and eye-popping read that is sure to entertain even the pickiest readers. As far as YA fantasy/paranormal novels go, this is one of my top favourites. With her eloquent prose and excellent world building, LaFevers delivers a deliciously unique, dark and magical page turner. A book so sparkly, fresh and mesmerizing, it's impossible not to fell under its charm - especially if you like intelligent, well-thought out and truly original plot lines. Are you still reading this review??? You should be ordering your own copy by now! "I bear a deep red stain that runs from my left shoulder down to my right hip, a trail left by the herbwitch's poison that my mother used to try to expel me from her womb. That I survived, according to the herbwitch, is no miracle but a signed I have been sired by the god of death himself." Ismae's mother tried to kill her even before she was born. Unwanted and unloved, she was raised by her abusive father, who did not for a moment believe her to be his own daughter. He thought her to be a daughter of Death Himself, and treated her accordingly - with raw temper and meaty fists. Ismae never knew love, kindness, warmth of family home, nor the feeling of belonging. After being sold into marriage, desperate to escape a lifetime of abuse and humiliation, Ismae manages to run away with the help of a priest. She finds refuge at the convent of St. Mortain, where those sired by Death are trained and prepared to serve as executors of His will. For the first time in her life, Ismae allows herself to believe that she has found her place in the world. Little did she know that what she thought to be a beginning of a new life filled with purpose and meaning, is in truth a dangerous, sticky web of lies and political intrigues. This novel was outrageously good. Action packed, atmospheric, dark, addictive - it's nothing like I've ever read before. In short: it was simply spectacular. LaFevers accomplished something magnificent here - she wrote a fantasy novel set against a vague yet fascinating historical background, with elements of paranormal, adventure and romance. A novel that is just unbelievably unique, sparkly and tantalizing. Both thematically exquisite and emotionally absorbing, Grave Mercy is a treasure. It has killer nuns, a strong and independent heroine that is skilled in dark arts and extremely hard to kill, a vibrant palette of diverse characters, rich and thrilling mythology, and - on top of everything else - an intelligent and obviously well thought-out plot line. LaFevers' prose is lush and flavourful. The narrative is swift, seemingly effortless, and crackling with tension. I found myself immediately drawn into the world that the author so magnificently crafted, mesmerized by the eerie and mysterious atmosphere, and ultimately fascinated by the many secrets and intrigues. While it's not exactly a book that you'll breeze through in one sitting (mainly due to its volume and level of sophistication), it's definitely one that you'll savour and appreciate, especially if you're a fan of high fantasy and epic adventures. Ismae is a wonderful heroine and I had an amazing time following her adventures. I enjoyed getting to know her better. She had one incredibly tough life. Her story moved me in ways I didn't at all expect, made me feel for her, cry for her, and cheer for her. Despite the physical abuse she endured as a child, and the internal struggle that followed her joining the convent, she stayed strong, managed to keep it together, and never lost hope. To me, Ismae is an inspiration and a role model. She's the living proof that if you believe in yourself, you can survive just about anything. Kudos to Robin for creating such a fabulous, believable and powerful character. In the end, all my raves and compliments are not enough to fully convey how wonderful a novel Grave Mercy really is. It's not your typical YA fantasy book, it's something deeper, more meaningful and complex than what YA industry got us accustomed to. Yes, this book provides you with phenomenal entertainment, makes you swoon over its character and keeps you guessing till the very end, but it also carries many profound messages and teaches you something valuable about life. Grave Mercy does not disappoint, so don't hesitate to pick it up. Thomas Allen & Son has generously offered to give away a GORGEOUS finished copy of Grave Mercy to one lucky Canadian winner! I love the concept of this book. Nuns as assassins? Score! I hope this is as good as Graceling by Kristin Cashore. 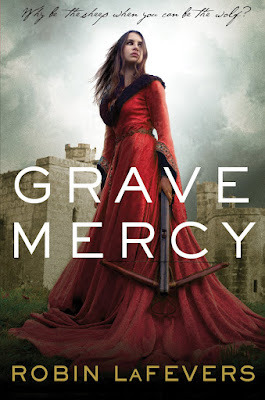 Grave Mercy sounds like a fantastic book. I like the premise of the daughter of the god of death and what she goes through to escape her life of abuse - and it has killer nuns, how awesome is that? I can't wait to read it. I love a strong heroine! The cover is amazing too! Killer nuns! WOOT! I love how the book is crackling with tension! YUMMY!!! Okay when you say simply spectacular and it's already on my must read list it just jumps higher on that list. What a life - to be unwanted and abused from the moment of conception! The review really gets across the blackness of the book but doesn't depress the reader so much that he or she doesn't want to read the book. That's a fine line to walk! Congratulations on that achievement. Awesome review!! I had a bit of a hard time with it at first since I don't tend to be big on historical fiction. After I searched the time period and was familiar with it I was able to really enjoy the book. I didn't love it, but I liked it a lot. Her writing is amazing, and I am really looking forward to Sybella's story!!! I've heard great things about this book, and can't wait to red it! Yay thanks for the chance to win! :) I want to read this book so badly!! kyaaaaaaaaa!! I LOVE LOVE LOVE your review! the huge amount of amazing adjectives plus your eloquent thoughts does give justice to this extrardinary and unique YA book!! Im SOOOO SUPER happy you loved this book as much as I did! Seriously my dear, This one also got into the top of my favorites!! ^.^ Yay! awesome review. What can be bad about killer nuns? I like that it is a historical novel, I always end up learning something about history. Great review! I'm glad to hear that the plot is good; I've been on the fence about ordering this book for quite some time, but I think I may have to get it! You got me when you talked about how strong Ismae is; I need more books with strong heroines! It 's pretty convincing that this book is good and will get me hooked (sorry for the double oo's XD) - in short, I'll put it on my wishlist. Wow that good huh? I have been wondering if this book would live up to my expectations - from the beautiful cover to the initial hype. Based on what you are saying here Evie I think it will - and you know I trust your opinion. I hope I win!!! :D Thanks SO MUCH for another fantastic giveaway! I'm so glad you loved this so much, Evie! So did I!!! It's so so SO good! <3 Well worth the wait! Wow, Evie---you REALLY LOVED this book! I especially liked your comment at the end: "Yes, this book provides you with phenomenal entertainment, makes you swoon over its character and keeps you guessing till the very end, but it also carries many profound messages and teaches you something valuable about life." I love books like that. You just never know when you've picked up a gem. I almost can't wait to find out if I won this giveaway!!! Look what you went and did! I'm just DYING to read this! Glad you love it so much! This book's been on my to-read list for a while, but I hadn't had too much incentive to actually go out and read it until now. Hearing all the great things you had to say about it, I'm definitely moving it up to the top of my list! Grave Mercy sounds intense and I am glad you liked it. I am not a all that into historical fiction, but this one actually sounds really good! Thanks so much for the giveaway! <3 ANITA, I LOVE YOU. I thought I was dying to get my hands on this book before, but after reading that amazing review I need to have it like now!